Entering the 2019 NCAA Tournament, the expectations for the Virginia Cavaliers and Oregon Ducks couldn't have been further apart. After all, Virginia was a 1-seed, while Oregon was a 12-seed. However, both teams made defense their calling card all season and have leaned on that ability to defend on their way to the 2019 Sweet 16. On Thursday night, the two schools from opposite coasts will collide in what should be one of the most physical games of the entire 2019 NCAA bracket. It all goes down at the KFC Yum! Center in Louisville at 9:59 p.m. ET. The Cavaliers are 8.5-point favorites, with the total at 119.5 in the latest Oregon vs. Virginia odds after rising as high as 121. 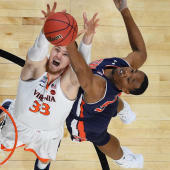 Before you make your 2019 Sweet 16 predictions, you should see the Oregon vs. Virginia picks from SportsLine's advanced computer model. This model, which simulates every game 10,000 times, has raked in the winnings for those following its picks. Over the past two years, the SportsLine Projection Model has returned over $4,000 to $100 players on its top-rated college basketball picks and entered the postseason on a strong 11-5 run on all top-rated college basketball plays. It's also on fire in the 2019 NCAA Tournament, calling all but two of the Sweet 16 teams this year. Anyone who has followed it is way up. Now, it has set its sights on Oregon vs. Virginia. We can tell you the model is leaning toward the over, but it also says one side of the spread has all the value. That pick is available only at SportsLine. The model knows the Cavaliers ranked last out of 353 Division-I teams in adjusted tempo according to KenPom, but that's by design because they work the ball effectively to get high-quality looks. It's why they rank second in the country in adjusted offensive efficiency and shoot 40.2 percent from 3-point range. They're also fifth in the nation in assist-to-turnover ratio. Even against another fierce defensive team like Oregon, a slow game plays into Virginia's hands because the Cavaliers get more out of their offensive possessions than their opponents. De'Andre Hunter (15.2 points per game), Kyle Guy (15.1) and Ty Jerome (13.0) all make at least 40 percent of their 3-point attempts, and their timely shot-making could very easily be the difference on Thursday night. But just because the Cavaliers are efficient offensively and ruthless defensively doesn't mean they'll cover the Oregon vs. Virginia spread. Oddsmakers have consistently underestimated the Ducks, who have covered six straight versus teams like UVA with .600-plus winning percentages. Junior point guard Payton Pritchard is averaging 18.5 points, 7.5 assists and 1.5 steals in the 2019 NCAA Tournament and keys an offense that's nailing 50 percent of its 3-pointers (20-of-40). Four Ducks scored in double-figures against UC Irvine, including reserve senior Ehab Amin, who drained all four of his three-point attempts. During their 10-game win streak, the Ducks have usually covered with ease. In fact, over its last three, Oregon has covered by at least 14.5 points each time. Who wins Oregon vs. Virginia? And which side of the spread has all the value? Visit SportsLine now to see which side of the Virginia vs. Oregon spread to back, all from an advanced computer model that's up over $4,000 on its top-rated college basketball picks the past two years, and find out.